Polar bear hunting is a chilly yet rewarding sport that appeals to many hunters. Proper outer gear and a knowledgeable guide can make the experience one you will treasure forever. Polar bears are white. The individual hairs are, in fact, transparent. When you see a yellow polar bear, this tells you that the bear is older and would be an ideal trophy animal. Polar bear hunting is strictly monitored, as polar bears are becoming an endangered animal. This is happening because the polar ice caps and glaciers are slowly melting away due to climate change. 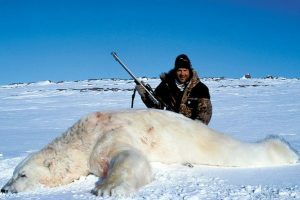 As a result, hunting of polar bears will eventually become an endangered sport. Polar bears are the size of Kodiak bears. Male polar bears can be twice the weight of a Siberian tiger. They have adapted their life to become semi-aquatic animals. They live on land, sea, and ice, and survive off marine life and vegetation. Polar bears are voracious carnivores. They will eat anything they can kill. Fish, birds, seals, and otters are their staple foods. Their only predators are humans and other bears that are larger than they are. Polar bears aren’t likely take you out on to the ice itself, however, be prepared for any terrain. Speaking of terrain, if you want to go hunting for polar bears, you will have to visit north or west Alaska, arctic Canada, Siberia, or Greenland. These areas are rough, cold, and in some cases, quite rocky. You will need spikes to keep your footing. Many hunters in these areas will recommend that you use bows. Ensure you bring your arctic gear, unless otherwise specified by the guide. This will make sure you are warm at night while hunting or when sleeping. The only time polar bears get overheated is when the temperature reaches 10 degrees or higher. Ironically, polar bears are invisible, except for their snouts and breath, when viewed through infrared photography. This type of equipment obviously will be useless to you. 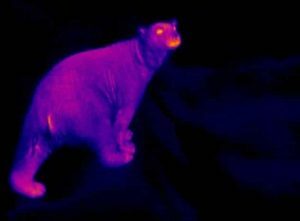 Even without the infrared equipment, polar bears are easy to spot with a trained eye’s assistance. Look for the signs that the guides tell you to look for footprints, movement, and bulk on the horizon and you should spot them quite easily. Polar bear hunting can be an exhilarating experience, using the right equipment, wearing the proper clothing, and using the right weapon to bring down your prey. Ensure you have the proper paperwork, and the right protection from other hunters. Learn what you can about polar bears and hunting them. How great your experience is also up to you. Only you can decide if you will embrace the experience as a challenge you intend on conquering or something else.